Just after putting in the jars. I have yet to tamp the cabbage down. The colour's a deeper purple now after one week. Last week I purchased a red cabbage for something or other. I can’t remember what now, really. It doesn’t matter, because for some reason – a change in recipe, lack of desire to cook (yes it happens to me) – it ended up an orphan in the pantry. My lack of using the cabbage could have been a secret desire to use a piece of new equipment that I recently purchased. Well, it’s new to me anyway. A “Value Village” purchase for $7. I bought a bowl. A big bowl – 13” across x 6.5” high. It’s a beautiful thick glass bowl with straight sides and I have no idea what its original purpose would be. It’s huge. Take a look at the photo. 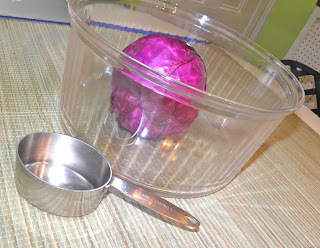 That’s a medium-sized cabbage sitting in it, and a 1-cup measuring cup, for scale. I think it might become a bread bowl in future. I could probably rise three loaves in it quite easily. That cabbage would have filled my other bowls. If anyone has an idea of its original use feel free to post it in the comments. 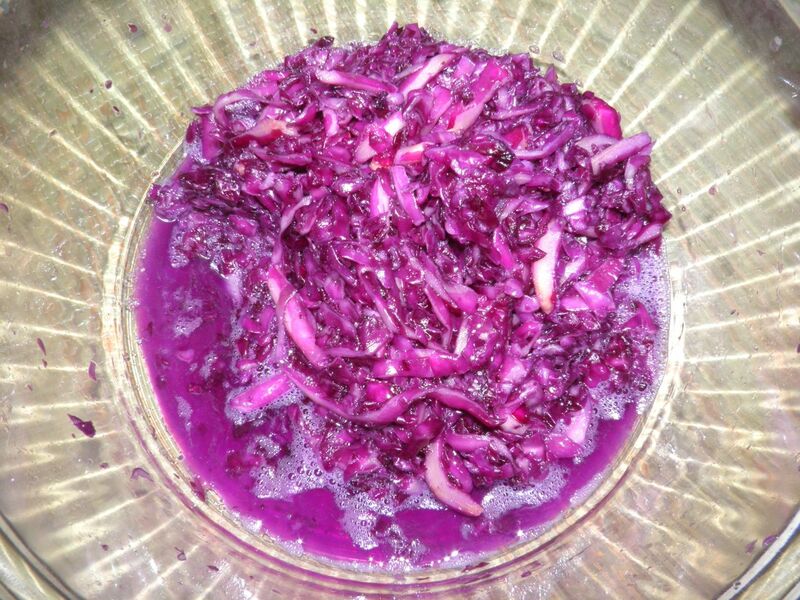 But this day it was to be filled with lacto-fermented red cabbage. The size of your cabbage will determine how many jars you get. 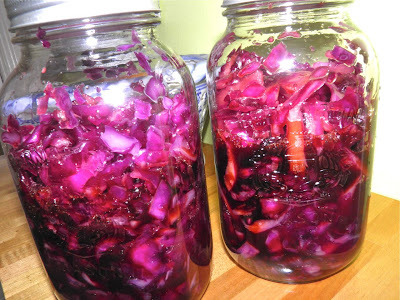 A medium large cabbage will give you two 1L Mason jars. For an extra kick I added 100ml of balsamic vinegar to each jar. 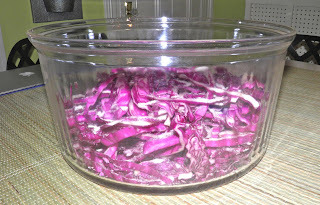 The lacto-fermentation does transform the taste of the cabbage. But there’s no real “sour” taste like commercial sauerkraut. That’s why In thought of balsamic vinegar. It took some investigation to see if that addition was even possible. I didn’t want to kill the good bacteria that makes the whole process work. Apparently a little won’t harm the bacillus bacteria too much. So that’s what I did. It should be fun in a few weeks to cook what will most certainly be an interestingly coloured side dish, or baked pork. Maybe that would be a good use – with white wine, juniper and thyme. Hmmmm… I have two jars. I can experiment. As you massage the salt into the cabbage liquid comes out. 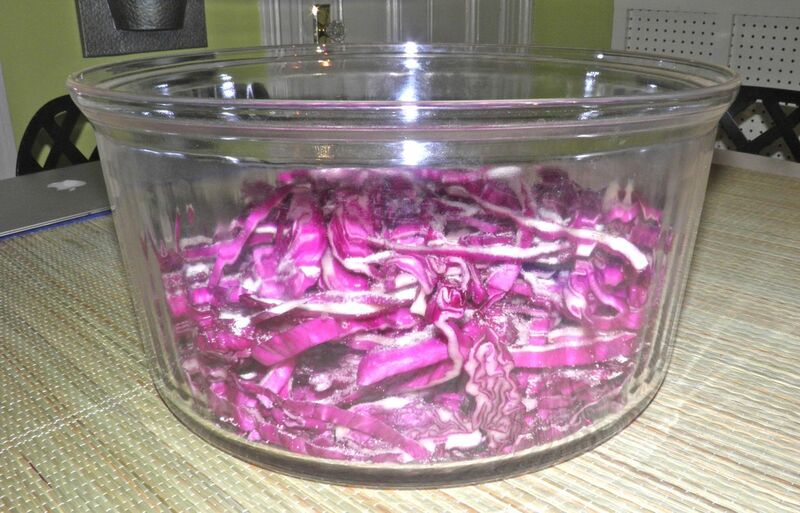 Slice the cabbage very thinly and place in a non-reactive bowl (glass, plastic or ceramic). Sprinkle the cabbage with the salt and gently knead the cabbage and salt together. Don’t try to break the cabbage up, just “massage” it. Keep massaging for about 20 minutes, until the cabbage expresses quite a lot of its liquid and the cabbage itself is quite pliable. Divide the cabbage and its liquid between sterilized Mason jars. Add 100 ml of balsamic vinegar to each jar. Shake to combine and then tamp the cabbage down below the level of the liquid. Cover tightly and place in a cool spot (not the refrigerator, a shelf) for 4 weeks before use.